Shop online for 109 micro-engr model trains at discounts up to 12%. Track / Accessories is the most popular of the 4 micro-engr model trains categories, then Bridge-Trestle-Girder, and Buildings. This is the N Scale Code 83 Nickel Silver Rail Joiners (50) Model Train Track Accessory by Micro Engineering. 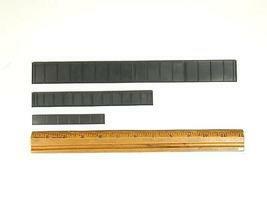 This is the 85' Plate Girder Pkg (4) Model Train Bridge in HO Scale by Micro Engineering. This is the Deck Girder Bridge w/Open Deck Kit 85' Model Train Bridge in HO Scale by Micro Engineering. This is the 80' Open Deck Girder Bridge Model Train Bridge in N Scale by Micro Engineering. 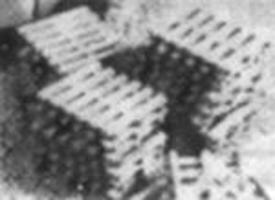 This is the Plastic Pallets Pkg(24) Model Railroad Building Accessory in N Scale by Micro Engineering. This is the Trans World Truck Terminal Model Train Building in HO Scale by Micro Engineering. This is the Standard Gauge Weathered Flex Track(TM) 3' Sections pkg(6) Code 83 Rail w/Wood Ties Model Train Track in HO Scale by Micro Engineering. This is the Outhouse Pkg(2) Model Railroad Building in N Scale by Micro Engineering. This is the Code 70 Nickel Silver Rail Joiners (50) Nickel Silver Model Train Track in HO Scale by Micro Engineering. This is the Nonweathered Flex Track(TM) 3' Sections (6) Code 55 Rail Model Train Track N/S in N Scale by Micro Engineering. This is the Small Shed Model Train Building in HO Scale by Micro Engineering. This is the Trans World Truck Terminal Model Railroad Building in N Scale by Micro Engineering. This is the Tall Steel Viaduct Tower Two 4 Story Bents Model Train Bridge in N Scale by Micro Engineering. 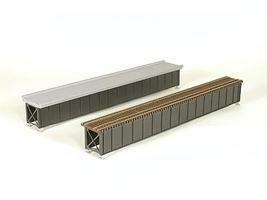 This is the Deck Girder Bridge w/Open Deck Kit 30' Model Train Bridge in HO Scale by Micro Engineering. This is the Poor Boy Mine Model Railroad Building in N Scale by Micro Engineering. This is the Standard Gauge Nonweathered Flex Track(TM) 3' Sections (6) Code 83 Rail Model Train Track N/S in HO Scale by Micro Engineering. This is the Double Track City Viaduct Kit 150' Model Train Bridge in HO Scale by Micro Engineering. This is the Outhouse Model Railroad Building Accessory in HO Scale by Micro Engineering.